In the Republic of Mali there is high cellular penetration so the terminator gets the opportunity to land large volumes of international calls in the country. At the same time, there is the high cost of VoIP minutes (17-20 cents), so you can make good money by terminating VoIP traffic. But is the Internet in Mali suitable for a profitable telecommunications business? Since Mali has a complex geography, which negatively affects the telecommunications market. There is almost no fixed connection in the country and the market of Internet services is poorly developed. Most of the country is an underpopulated desert, many areas are hard to reach. The situation is aggravated by the fact that the government is investing insufficiently funds in the development of the telecommunications sector. In addition, there is poverty, a high level of illiteracy and a low level of personal computers use in Mali. Thereby, the penetration of the Internet is only 12%, and all efforts are aimed at developing a more promising mobile sector (penetration of cellular communications reached 143%, with a population of more than 18 million people). The market for Internet services barely meets the needs of the large cities residents, and in other areas the ability to connect to the Global Network is practically absent. 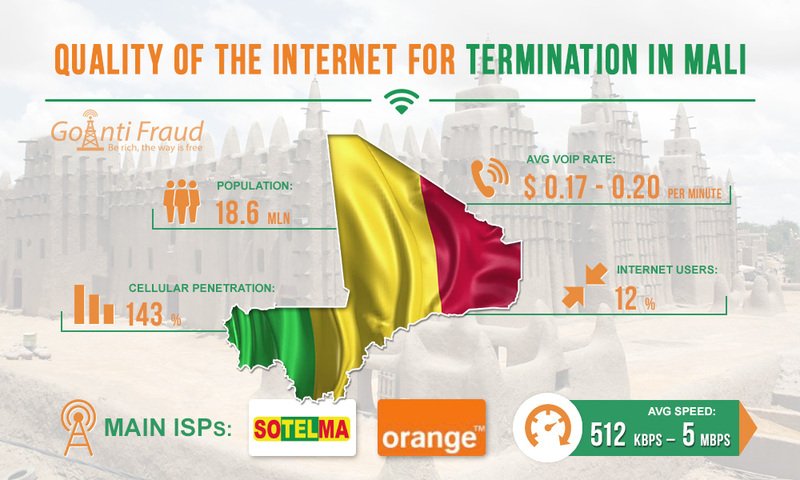 Nevertheless, in Mali there are many Internet providers that provide services for connecting to wireless Internet, as well as DSL/ADSL technologies. The most stable and high-speed Internet can be found in the capital – Bamako. Moreover, the high penetration of mobile connection, with the low development of the fixed-line market provides a great potential for the development of mobile broadband services. However, Mali has no access to the sea, which makes the country depend on neighboring countries for international bandwidth. This is the reason for high tariffs for services. In the near future, the situation is expected to be improved, as new international fiber-optic cables were connected in the region. In Mali the best place for installation of VoIP equipment is the capital. And it is necessary to use gateways with a minimum number of ports for one location. Due to high call voip rates, the terminator can easily earn on landing small amounts of traffic. GSM termination for “dummies”: How to mask the Internet traffic?